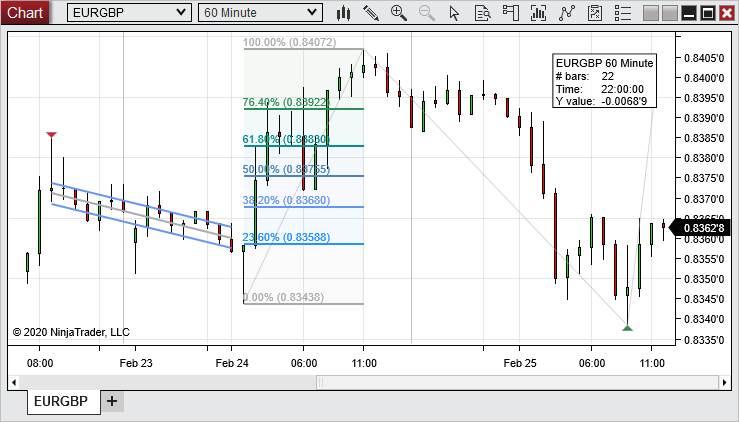 There are many customizable Drawing Tools and objects available to use in NinjaTrader charts. Drawing Tools can be applied to individual charts or all open charts displaying the same instrument, and templates for each Drawing Tool can be saved to apply commonly used properties in the future. Various Drawing Tools are available and customizable within a chart. The image below shows an example of several Drawing Tools applied to a chart. When "Stay in Draw Mode" is enabled from the Drawing Tools menu, any drawing tool you select will remain selected after creating a drawing object with that tool. The Drawing Tool can then be used to draw multiple objects without having to access the Drawing Tools menu each time. The Ruler measures the number of bars, length of time, and y-axis distance between two anchor points for a Data Series. The measurement data is attached in a flag at a third, independent anchor point. 5.Left mouse click a third time to set the anchor point for the Ruler display flag. The anchor points can be relocated by left mouse clicking on an anchor point and dragging it to a new location. In the image above, we see the ruler tool used to measure a distance of 42 bars over 7 hours, with a y-axis movement of 10.75 points. The Risk-Reward tool can help you to determine the placement of your profit targets to achieve a specific risk/reward ratio on any trade. Once the object has been drawn and the Risk/Reward ratio set, two lines will extend outward from the first anchor point. The first line, culminating in a number colored red by default, represents the maximum risk you are willing to take, as specified by the second anchor point. The second line, culminating in a number colored green by default, represents the price point determined by multiplying the risk by the chosen Risk/Reward ratio. The Region Highlight X and Region Highlight Y tools allow you to highlight or shade an entire horizontal or vertical region on a chart. 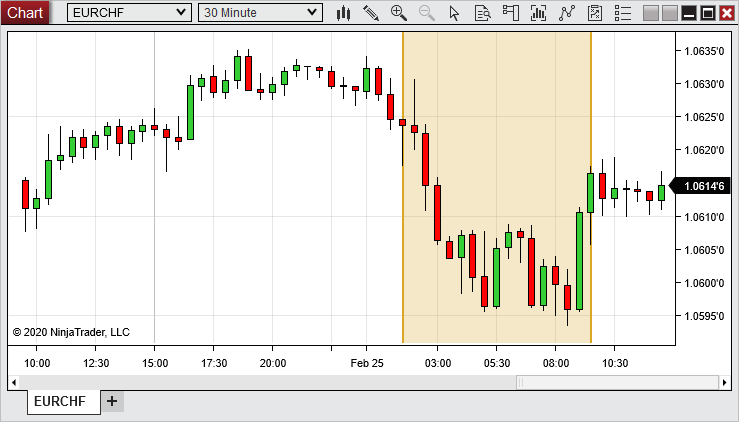 The Highlight Region X tool will highlight a horizontal region, and the highlighting will extend indefinitely upwards and downwards, keeping the highlight in place if you choose to re-scale the chart on the price axis. The Highlight Region Y tool will highlight a vertical region, and in the same way, will extend the highlighting indefinitely to the right and left, allowing you to draw a region which will continue to cover the entire width of the chart as new bars come in, or as you scroll backwards on the time axis. The image above shows the Highlight Region X tool in use, highlighting a 7-leg uptrend. The image above shows the Highlight Region Y tool in use, highlighting a recent consolidation. 1.Select a drawing tool from the Drawing Tools menu. The cursor will change to resemble a pen (Right clicking or pressing the "Esc" key will cancel the operation). 2.Left mouse click on the chart where you wish to set the first anchor point. 3.Left mouse click again on the chart for any other necessary anchor points. Once all anchor points are set, the cursor will change back to the cursor type you had previously selected. Once the Drawing Object is applied to the chart, it can be selected by left mouse clicking on it. Once selected, the object can be moved throughout the chart, and the anchor points can be moved by left mouse clicking and dragging to a new location. Each Drawing Tool can be customized using the Drawing Objects window. 1.Left mouse click on a drawing object to select it (once selected, the anchor points will be visible). 2.Either double left mouse click on the drawing object, or right mouse click and select the Properties menu item. The Drawing Objects dialogue is also accessible directly from the Drawing Tools menu on the chart toolbar, or by right mouse clicking in a chart, then selecting the Drawing Tools menu item. Note: Regardless of the method used to open the Drawing Objects dialogue, all Drawing Objects on the chart will be accessible in the dialogue. At any time, you can select a different object from the list in the "Configured" section to edit its properties. Properties vary between drawing objects. There are common properties, as shown in the image below, and there are also specific properties depending on the type of Drawing Object. The general properties of the drawing object are located in the General section. The image below shows the General section properties for all Drawing Objects, as well as addition properties unique to the Line Drawing Object. Adds the Drawing Object to the auto-scaling of the chart. Locks the Drawing Object in position on the chart, making it immovable. You can also lock a Drawing Object by left clicking the object to select it, then right clicking the object to view the right click menu, then selecting Lock. The Tag property is a naming convention used to access the drawing object via NinjaScript. Any Tag values generated via NinjaScript are grayed out and cannot be changed. Each Drawing Object must have a unique Tag value. Drawing Object properties can be saved as a template, allowing you to quickly apply those settings to a new Drawing Object of the same type in the future. Attach to will default to the Data Series on which the object is drawn. Tag will be automatically updated for each new drawing object. Locked will default to False. Visible will default to True. Properties within the Data section will NOT be saved. 1.Open the Drawing Object Properties window by either double left mouse clicking on the drawing object or right mouse clicking and selecting Properties. 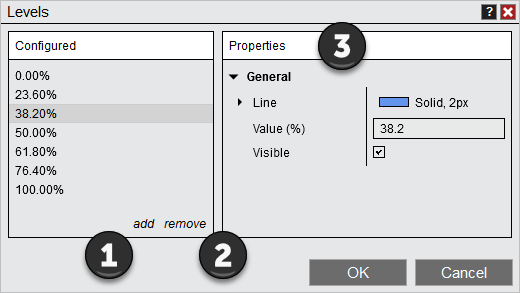 3.Left mouse click on the template text located in the bottom right of the Properties dialog. Selecting save will open the Save window, in which you can enter a name for a new template or select an existing template to overwrite it. If you wish to load a previously saved template, you can select the load option after left mouse clicking on the template text. If you change your settings and later wish to go back to the original settings, you can left mouse click on the template text and select the restore option. In the image below, a template will be saved for the Ray drawing tool. In the image below, we can enter a name for the new Ray template and save it for future use. Tip: Saving a new Drawing Object template with the name "Default" will make it the new default template for that Drawing Tool. The new default template will then be automatically applied to any new Drawing Object of that particular type in the future. A Drawing Object template that was previously saved can be applied to any Drawing Object of the same type. For example, a template for the Fibonacci Extensions tool can be applied to a Fibonacci Extensions Drawing Object, but not to a Line Drawing Object. 1.Left mouse click on the template text, then select the load option. 2.The Load window will appear. Select the template to load from the list of templates, then press the Load button. 1.The Save or Load window will appear, depending on which menu item you selected. Right mouse click the template for removal from the list of templates, then select the Remove menu item. 2.The Save or Load window will appear, depending on which menu item you selected. Right mouse click the existing template in the list, then select the Rename menu item. In the image below, we can either remove or rename the selected Drawing Object template. 2.Left mouse click on the Remove All Drawing Objects menu item, and dialogue box will appear to confirm that you wish to remove all drawing object. 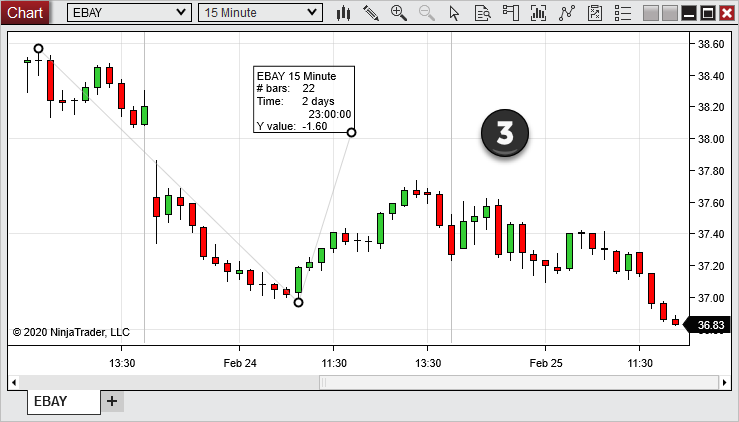 •Removing a Global Drawing Object will remove the object from all charts. 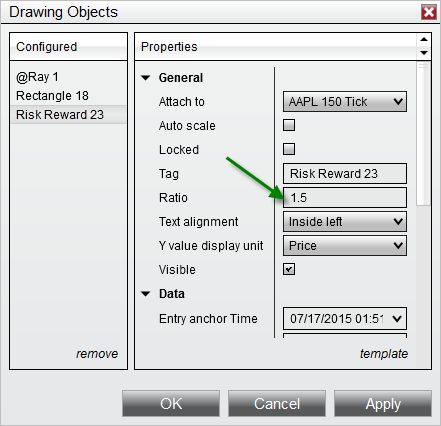 •Using the Remove All Drawing Objects menu item will NOT remove any locked drawing objects from the chart. Drawing Objects placed via NinjaScript will not be removed by this method, either. 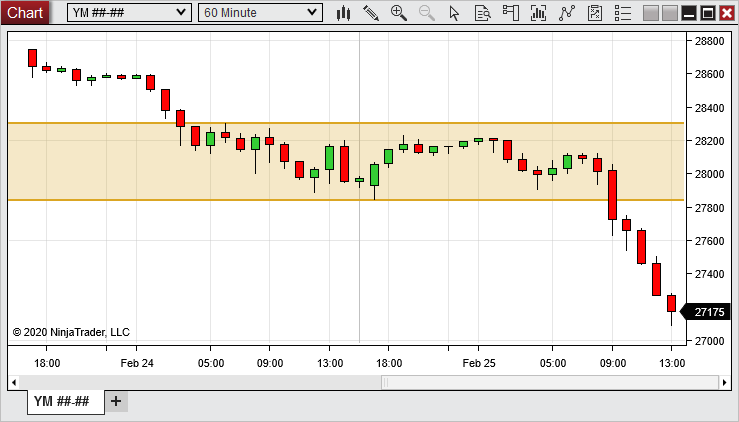 Drawing Objects can be applied to a specific chart (local), or to all charts of the same instrument (global). The Drawing Object will now be applied to all charts for that specific instrument as well as any new charts opened for that instrument. 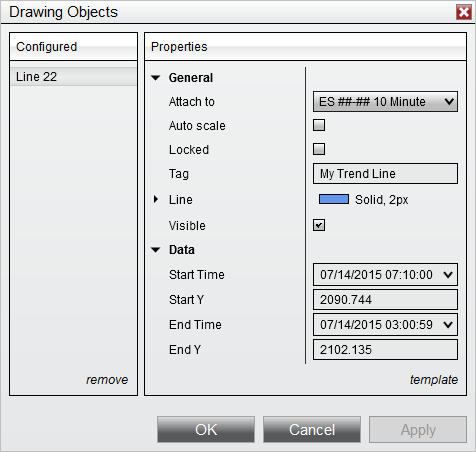 Global Drawing Objects are stored even when a chart of the instrument is not open. •You can set Global Drawing Objects to be drawn in all currently open workspaces in the General section of the Options window. To access the Options window, select the Tools menu from the Control Center, then select the Options menu item. 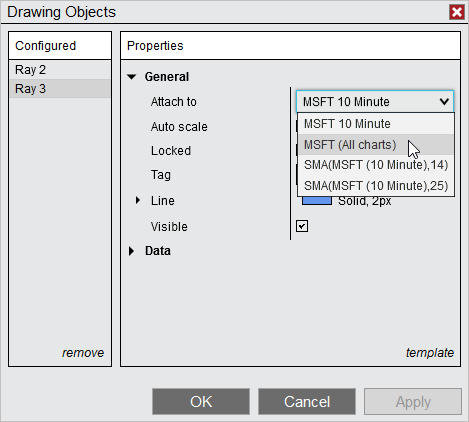 In the General section of the Options window, enable or disable the "Global drawing objects across workspaces" property. •If you wish to exclude a Global Drawing Object from one or more charts, you can do so by setting the property "Show global draw objects" to false in the Format Data Series window on the chart(s) you wish to exclude. •Making a draw object global means that the object would be redrawn and thus the z-order reset to its default. •A drawing object marked as global will only display on other charts that match the scale justification of the plot it is attached to. 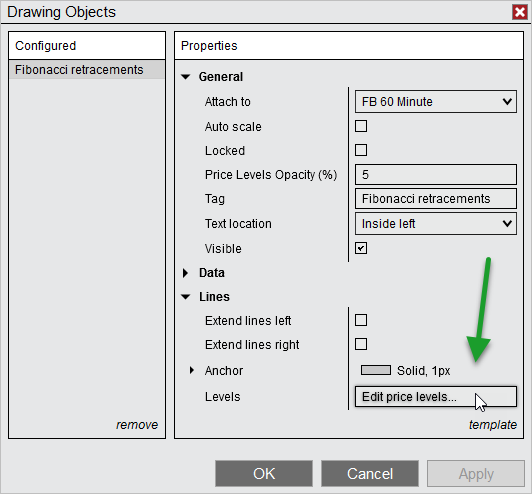 Drawing Tools that include lines drawn at multiple, customizable price levels, such as Fibonacci Retracements, include a "Levels" property which can be used to add, remove, or edit levels displayed in objects drawn with that Drawing Tool. To add, remove, or edit levels, first left mouse click on a Drawing Object to select it, then either double-left mouse click the Drawing Object, or right mouse click it and select the Properties menu item to open the Drawing Objects dialogue. The Levels field will display the number of levels currently applied. Left mouse click within this field to open the Levels dialogue, in which you can manage the levels applied to that object. In the Levels dialogue, click the add option to add a new price level. A new level will be added to the bottom of the list in the "Configured" section, and will be automatically selected for editing. You can then customize the new level's line color, dash style, width and value (in percent) the "Properties" section. You can also enable or disable visibility of the level in this section. Note: The value property of a level is always expressed in percentage terms, and the placement of the line corresponding to that level will be based upon the anchor points you set for that particular Drawing Object. To remove a level from within the Levels dialogue, first select the level you wish to remove from the list, then select the remove option. To edit an existing level from within the Levels dialogue, first select the level you wish to edit, then change any of the properties for that level in the Properties section. When all properties are set to your desired values, click the OK button to save the changes and close the window.